By Miguel De La Torre. 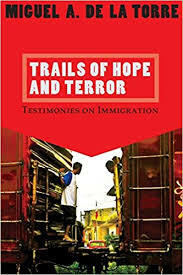 Each of seven sections (Borders, Economics, Myths, Family Values, the Politics of Fear, Christian Perspectives, Ethical Responses) exams an issue and then has a story by an undocumented immigrant or someone who works with the undocumented as well as a poem, prayer, or a song that expresses the hope and the terror involved in the experience. Read more.